My mother and father immigrated from Bavaria Germany shortly after WWII. Pretzels were not available in Canada, so my mother made her own. Like many people, she had no recipe to go by, so she made one up. She also never wrote it down. I have spent many years looking for the perfect recipe and finally found the one I liked. In my Black & Decker Bread Machine recipe book is a pizza dough recipe that had the same ingredients that my mother used in her recipe. Measure ingredients in order listed into bread machine baking pan. When cycle is complete, remove dough to a lightly floured surface. Cut into 8 pieces. Roll each piece into a rope measuring about 24 inches long. Form into pretzels. Let rise in a warm place for about 1/2 to 1 hour. 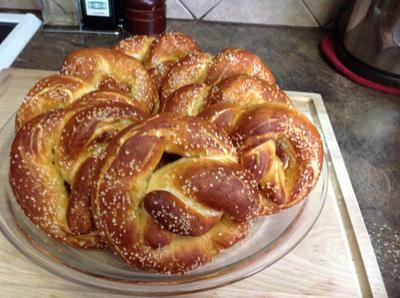 Place each pretzel one by one into a boiling soda water bath for ten seconds. Remove from water to a parchment lined baking sheet. Give them lots of run to expand. Sprinkle with coarse salt. Bake in a 350 degree oven for about 14 minutes. I don't see why not. Buns, Laugenbretzel, should work with this nicely. Can you make buns with this recipe? Do you have regular bread machine recipes.